Right in the heart of the Midlands lies one of our favourite wedding venues and we were thrilled to spend the day with Andrew Craner at Coventry Cathedral taking pictures of this unique venue transformed from its usual place of worship, into the most gorgeous wedding reception venue! 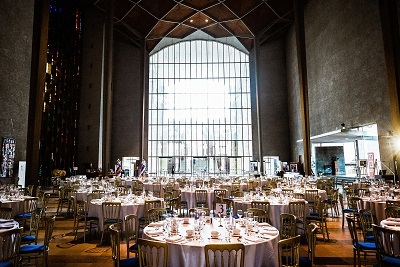 I fell in love with this venue when I met Racheal from Coventry Cathedral and have never come across such a versatile building that offers so many opposing spaces within the grounds. 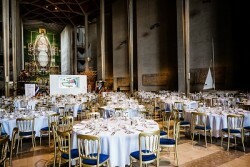 The ruins can be hired for a drinks reception and can even house a glass marquee. Once illuminated at night, the landmark provides a magical backdrop for spectacular weddings. The Cathedral Nave can also be hired with its glorious stained glass windows that flood colour throughout the reception area. 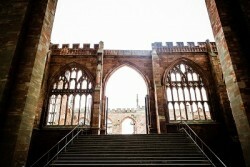 Or you can even combine the two spaces if you really want to utilise everything this unique wedding venue has to offer! 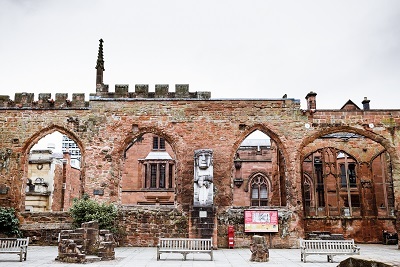 The venue is steeped in history with the ruins dating back to the 14th Century, and the current Cathedral dating back to the 1950’s. Its lavish history shines through the entire venue and if you are looking for something completely unique, this is the venue for you! 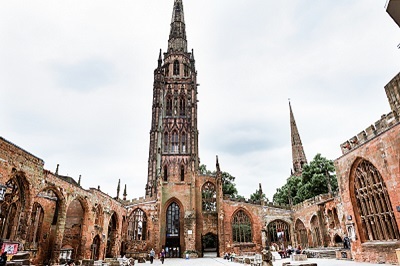 Andrew Craner arrived with his swag bag of cameras and gadgets to snap some breathtaking photos and the weather held out for us as we stalked the venue for the best possible shots amongst the Shakespearean group that had assembled to perform in the ruins! The images captured by Andrew Craner of the ruins capture everything I love most about this venue – the raw history. Once inside, the catering team used gold chivari chairs and crisp white linen which popped perfectly against the green tapestry backdrop in the Nave. We are pretty sure you will agree, the images he took really showed off the best the venue has to offer, and we cannot recommend him highly enough! 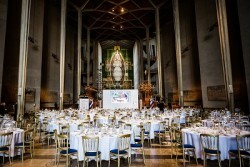 This beautiful venue can cater for intimate weddings for as little as 30 guests and large weddings for up to 800 guests. It is perfectly located for guests travelling from both the north and south with its fantastic transport links and ample local accommodation!